I would hope here, however, all of us have read anthropologist Laura Bohanan’s essay “Shakespeare in the Bush,” which is her account of several West African tribal elders critiquing—and correcting—her account of Hamlet over a rainy summer. It’s widely available on the Internet and very funny. It’s insight grows out of our ethnocentric cultural relativism that lets most readers see what we become as soon as we attempt to interpret works from any other culture—even works from different parts of our own. Regularly I have used it as a teaching text, and my graduate students who are unfamiliar with it up till then often take it on for use in their own classes. The rest of the story proves her to be massively wrong — and hilariously so. But I was amused by the very first assumption: that the plot and motivation of great tragedies like Hamlet are clear even to us. First, it isn’t possible to say definitively whether Hamlet was insane, or simply a brilliant actor. Second, so much of the language is inaccessible to us today that we miss key aspects of the play, such as its considerable lewdness. Third, the world we live in now is nothing like Shakespeare’s England. Politics, money, and love all have different rules. We might think we know what those rules are, but all we’re really doing is taking our current morals and ethics and applying them to a past that used different ones. I love Hamlet (despite Ophelia’s sucky fate). It’s my favorite Shakespeare play, even more so than his fabulous comedies. It’s partly because I watched the Mel Gibson version in 1990, and Mel Gibson was hot. It’s also partly because insanity fascinates me. It’s also because every time I watch it, the story is different. The Mel Gibson version was especially exciting at the time, because it reinterpreted the character. 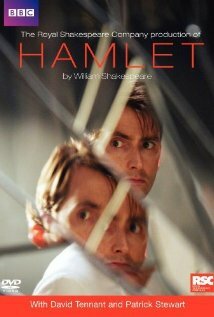 So imagine my delight when the Royal Shakespeare Company came out with a version of Hamlet in 2009 starring the guy who played the Doctor in Doctor Who. David Tennant is hot. I was expecting stage magic. I was expecting it to be as fun as Mel Gibson was to my twenty-year-old self, because obviously, from my recollection, Mel Gibson must have played the definitive Hamlet. Stage magic I got, but this Hamlet was a different guy. Not at all romantic. The story was a different story altogether. There are only twenty years between Mel Gibson and David Tennant, but our society has changed considerably, and so has Hamlet. All the pompous earnestness is out, and all the sexuality is in. For instance, the fair Ophelia (Mariah Gail) holds up a pack of condoms as she complains to Laertes about the unfairness of the sexual double standard. As for Hamlet’s righteous anger at his mother for marrying his uncle? It goes from justified to creepy in the flash of an eye. Here are two short youtube videos, showing Mel Gibson and David Tennant, respectively. “A Bloody Deed,” with Mel Gibson. “A Bloody Deed,” with David Tennant. TRIGGER WARNING. Hamlet is not a universal story. But it is, perhaps, a mirror — an opening for us to view our own ethnocentric assumptions. I have some thinky thoughts about these articles but nothing fleshed out enough to make into a proper blog post. In the meantime, all these things are worth reading. Plus, Shakespeare in the Bush. Anyhow, I’ll keep at it.